The text has a simple layout: seven lines are displayed in one single column, with a wide edge on the left where several visual markers, made with red ink, are visible. The manuscript text describes when someone knows love. In the first line it mentions a someone (‘Whoever’) who may or may not see Jesus as he is nailed to the cross with Mary and John weeping nearby. Lines 3, 4, and 5 describe the wounds inflicted on Jesus’ body and how he received them. The sixth line again speaks of a person, and although it is not clear if it continues the description of Jesus on the cross, it could also have picked up the ‘whoever’-person again. As such it is that person who weeps for Jesus’ plight as well, and by this act of weeping it shows that such a person is capable of or is able to love his fellow man. The poem is of religious nature and it could have been used by the monks and priests to teach the common people what love is, how to love, and that it is one of the cornerstones of the Christian faith (faith, hope, love; commonly displayed as a cross, an anchor and a heart). The genre to which this text belongs is primarily religious. Textual evidence demonstrates this conclusion, since there are references to biblical figures among which are Saint Mary, Saint John, and Jesus. Supporting evidence for this inference is the occurrence of a passage from Respice in faciem Christi on the same page. Ayoush Lazikani argues that this psalm is the basis for Wose seye on rode, which she concludes from the fact that both texts occur on the same page. Moreover, she provides a notable comparison between the ‘three-dimensional focus on the Cross and the redemptive force of the Wounds’ that exhibits the relation between Wose seye on rode and Respice in faciem Christi. Therefore, from textual evidence and Lazinkani’s analysis, it can be concluded that Wose seye on rode participates in a religious genre. Characterized by a tone of both exaltation of Jesus sacrifice and admonition to men as sinners, the text could likely have been used by a preacher or a priest, though not necessarily during a religious service. The text was conceived and produced to be mainly addressed to an audience within a religious context; in other words, these lines could have been written in order to pursue the indoctrination of commoners yet could as well work as memento for the members of the clergy. The pattern of verses is AABBCDE; the language tends to use some poetic embellishments like “bitter tears” (lines 6 and 7), and “fair hands” (line 4). In addition to the genre, textual evidence also provides information about the dialect in which Wose seye on rode was written. Various features allow for an identification of the regional dialect. In the case of this text, the spelling of ‘rug’ in line 5 and ‘sunne’ in line 6 indicates that this text was written in the west Midlands dialect. Another key feature is the use of o, as opposed to a, in the spelling of ‘lefmon’ in line 1 and ‘con’ in line 7 which demonstrates similar use of the west Midlands dialect. 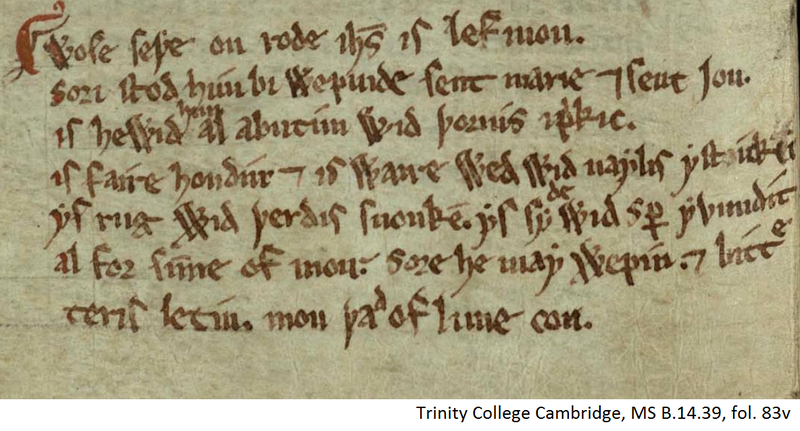 Interestingly, the degree of influence that this dialect has on the spelling of the words becomes apparent from the appearance of the same text in a different manuscript. For example, ‘rug’ and ‘sunne’ in the Cambridge Manuscript are spelt as ‘rig’ and ‘sinnes’ in the Royal Manuscript 12. The aforementioned ‘lefmon’ and ‘con’ are spelt as ‘lemman’ and ‘kan’. These spellings in the Royal Manuscript 12 are characteristics of the northern dialect. However, not only the spelling in a text provides evidence for the localization of the dialect but also the morphology. The present participle ending of ‘wepinde’ in line 2 is for example a key feature of the southwest Midland dialect. This mixture of dialect led Wendy Scase to conclude that this specific scribe ‘does not have a consistent system for writing’. Thus, an analysis of both spelling and morphology in Wose seye on rode allows for a localization of the dialect, while simultaneously demonstrating that the scribe did not follow a consistent system. There are at least three alterations to the text, although it is debatable whether they are mistakes made by the scribe while copying the manuscript or parts that the scribe added himself because a previous scribe had made the mistakes. The first can be seen in the third line, just after the second word (‘hewid’) where a small ‘[him]’ has been added above the line. The second is similar to the first, but here it concerns only part of a word and not an entire word. In line 5, in the sentence after the full stop, the second word (‘sy-‘) has only been written partially with the second part of the word (‘-de’) added above the line. The third is somewhat of a mystery, due to the fact that it is not clear whether it is a mistake made by the scribe or whether it is due to the fact that the parchment ended and there was not enough space left to finish the word properly. It concerns the last word of line 6 (‘bitt[-e]’). The ‘[-e-]’ has been added above the line, whereas the final “-r” of (‘bitter’; the intended word) is missing altogether. A fourth possible mistake can be found in line 4. This one is similar to that of line 6. At first impression, it appears to be two words: ‘yst’ and ‘icki’. But when consulting a Middle English dictionary, it proves to be one single word instead of two (‘ysticki’) with the empty space in between appearing to have been scratched from the parchment (another possible scribal error?). The final “-t”, just like the final “-r” in line 6, is missing completely. However, again as with line 6, it is not clear whether this is a scribal error or merely due to the scribe having not enough parchment to finish the word. A seventh mistake occurs in the last line. The second word after the first full stop has a “d” added above the line. Given the context, this appears to be a scribal error. There are two types of punctuation within the text. The main form of capitalization appears at the beginning of each line: the first letter of each line is slightly more red than the other letters (except perhaps for the last line), although this form of capitalization does not appear after the full stops mid-sentence. There is, however, a paragraph indicator present at the start of the first line as a form of embellishment. There are several examples of abbreviations in the text. In the first line, the abbreviation ‘ihs’ is used, which commonly stands for the clerical abbreviation of ‘Jesus’, in full the abbreviation stands for ‘Iesus Hominu Salvator’. In line three, the abbreviation mark above the “p” can be found. The straight line upwards from the “p” indicates that the letters ‘[-ri-]’ follow directly after the “p”. In line 5 the macron ‘e’ is an abbreviation for ‘e[n]’. Similarly, in line 6 the macron ‘u’ stands for ‘u[n]’. nearly an entire word (‘p[er]’), giving the word ‘s[per]’. Lazikani, Ayoush S. Cultivating the Heart: Feeling and Emotion in Twelfth- and Thirteenth- Century Religious Texts. Cardiff: University of Wales Press, 2015. Leclercq, Henri. “Methods of Abbreviation.” in The Catholic Encyclopedia. Vol. 1. New York: Robert Appleton Company, 1907. Oxford, Balliol College 149, ff. 12v-13, London, British Library Harley 331, f. 96r2 and Worcester, Worcester Cathedral Library F.10, f. 25. http://www.dimev.net/record.php?recID=160. Scase, Wendy. “Re-Inventing the Vernacular: Middle English Language and Its Literature.” In The Cambridge Companion to Medieval English Literature 1100–1500. Cambridge: Cambridge University Press, 2009. Shahan, Thomas. “Ecclesiastical Abbreviations.” in The Catholic Encyclopedia. Vol. 1. New York: Robert Appleton Company, 1907. The crucifixion of Jesus Christ is mentioned in the New Testament; in the Cannonical Gospels with no substantial differences, and in some epistles. Wose seye on rode ih[esu]s is lef mon. Sori stoð him bi wepinde sent marie [and] sent jon. Is hewid [him] al abutim wið þornis ip[ri]kic. teris letin. Mon þa[d] of luue con. Whoever may see Jesus, his dear one, on the cross. Saint Mary and Saint John stood by him weeping sorrowfully. His head pricked with thorns all around. His fair hands and his feet stuck with nails. His back beaten with rods. His side wounded with a spear. All for the sins of man; he may sorrowfully weep. And let bitter tears fall. That man can love.